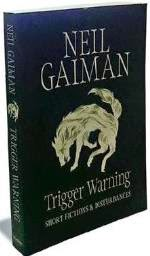 The third of Neil Gaiman's short story collections, Trigger Warning includes a couple of novellas set in existing fantasy universes - there's a Doctor Who story, "Nothing O'Clock," set during Eleven's first season, which comes up with some new monsters whose entire existence is based on screwing with time, so it's a satisfying little addition to the Doctor Who canon; and the finale is an enjoyable American Gods sequel, "Black Dog," with some creepy moments. Of the rest of the stories as usual I wasn't a fan of most of the poetry, and a number of the short stories did very little for me, but there's a few very strong ones in there as well: A Sherlock Holmes story, "The Case of Death and Honey," wonders why a character so easily bored chose beekeeping as his retirement pastime, and comes up with a bit of a wild answer; a pair of stories, "Observing the Formalities" and "The Sleeper and the Spindle," give different twists to the Sleeping Beauty fairytale; "The Return of the Thin White Duke" is an origin story for how David Bowie came to Earth; "The Thing About Cassandra" would make you a bit concerned if you ever had an imaginary friend. The most old-fashioned spooky tale is "Click-Clack the Rattlebag," but the one I found creepiest, and probably the one most worthy of an actual trigger warning, was "Feminine Endings." What's maybe even creepier is that in his introduction he says this is the story he wrote for his wife when he first met her.